The whole is much more than just the sum of its parts. From February 17 to 21, 2019, Abu Dhabi, United Arab Emirates, will host one of the world's largest defence technology trade fairs. As is the custom, among the exhibitors there will be companies of the CZECHOSLOVAK GROUP (CSG) holding and also TATRA TRUCKS, which is closely linked to the group. The companies of the CZECHOSLOVAK GROUP and TATRA TRUCKS will bring several new products and interesting exhibits to IDEX 2019h. At the prestigious event, stands CPC 410 and CP-420 will host EXCALIBUR ARMY, TATRA TRUCKS, RETIA (part of the CSG Aerospace Division), as well as MSM Group representing the Slovak section of the CZECHOSLOVAK GROUP holding. For example, EXCALIBUR ARMY will unveil the BM-21 MT 4x4 rocket launcher on the TATRA FORCE chassis, which uses the proven and wide-spread GRAD 122 mm launcher. It is equipped with a completely new fire control system, new electronic systems and controls. These, in combination with the tried and tested launching system, make for a proven, effective and reliable combat set. 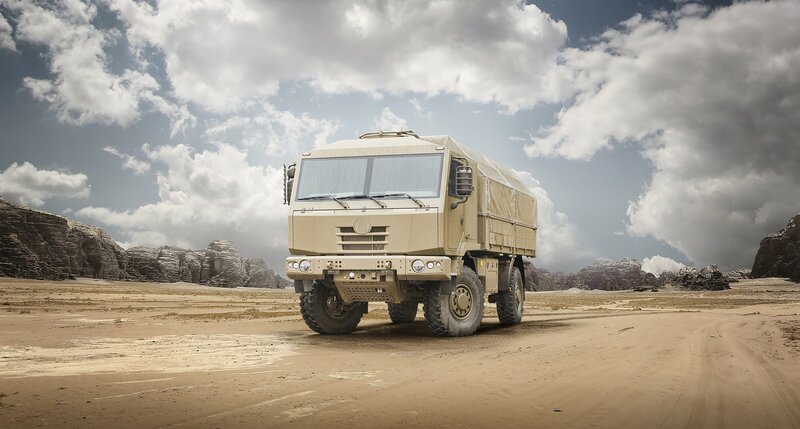 Moreover, the modern chassis supplied by TATRA TRUCKS lends this combat vehicle exceptional handling on and off the road and brings its mobility to a whole new level. The MSM Group will present its entire portfolio of both small and medium-calibre ammunition, as well as modern ammunition for 155 mm artillery systems and for 81 mm mortars. ZVS handguns will be featured as well. The exhibits on display will include the latest project, Hornet anti-tank guided missiles, as well as the lightweight, portable ANTOS series mortars. TATRA TRUCKS Kopřivnice will unveil the new TATRA TACTIC 4x4 medium truck at IDEX. The TATRA TACTIC is equipped with an entirely new Tatra cabin with a capacity of up to 4 crew members, powered by a proven 210-kW Cummins engine coupled with a fully automatic Allison transmission. The maximum weight of the new vehicle is 13 metric tons while the maximum payload is 5.5 t. Another exhibit will be the TATRA PHOENIX 6x6 truck designed for military use, equipped with a powerful six-cylinder PACCAR engine. RETIA will also be among the exhibitors, which is part of the recently established CSG Aerospace division. It will introduce its new ReGUARD radar to the world. This is a multi-purpose 3D radar for the detection and simultaneous tracking of ground targets and slow-moving low-flying targets with small reflective surfaces. ReGUARD will be available in both stationary and mobile formats. It works on the principle of electronic deflection of radar beams and mechanical rotation of the radar head, achieving a range of up to 18 km with the capability of monitoring targets up to 3 km of altitude. The latest version of the special ReTWis 5 radar device will be featured as well, capable of detecting living objects and persons behind non-metallic obstacles, such as walls. The importance of IDEX, which is held every two years, is constantly growing. This is evidenced by the number of exhibitors and visitors. In 2017, over 1,200 exhibitors from more than 57 countries took part in the exhibition, and the attendance exceeded 100,000 visitors. It is not without interest that in 2017, the companies of the CZECHOSLOVAK GROUP and TATRA TRUCKS exhibited on the largest area of all Czech participants and held a prominent place among European exhibitors. Their exhibits have become the focus of attention, as evidenced by the visit of Sheikh Mohammed bin Zayed Al Nahyan, Crown Prince of Abu Dhabi, and Deputy Supreme Commander of the United Arab Emirates (SAE). This major politician honoured only a few expositions with his presence at the 2017 event, with the exhibition pavilion of the CZECHOSLOVAK GROUP and TATRA TRUCKS among them. CZECHOSLOVAK GROUP is a holding that builds upon the tradition of Czechoslovak industry, supporting and further developing the activities of traditional Czech and Slovak companies in the field of civil and defense industrial production. Its portfolio includes the production and sale of engineering products for the automotive, rail, aircraft and watchmaking industries, as well as the production of special vehicles, off-road trucks, weapons and weapon systems or ammunition. The group puts a strong emphasis on the quality of its products and services and on its export activities. The products of the companies of the holding can be found on all continents and the number of its customers is growing steadily. CZECHOSLOVAK GROUP's holding companies employ more than 8,000 people, and in the year 2017 they generated revenues worth CZK 25 billion. In 2013, TATRA TRUCKS joint-stock company took over the world-renowned carmaker based in the Czech town of Kopřivnice, which underwent a successful restructuring after the ownership structure change. Besides standardized model ranges, it produces special trucks tailored to customer requirements. Eighty percent of the automaker's output is exported. TATRA TRUCKS employs more than 1,100 people, and another 600 employees work in the subsidiary TATRA METALURGIE, focusing mainly on foundry and forging.